heater, thermowell, and thermocouples (multiple). What is a custom heater assembly? In general terms, a custom heater assembly is a device that transforms electrical current to heat energy, is designed in a way that accommodates the needs of a unique heating requirement, and is used for the heating of gases, liquids, plastics, or metals. A thermowell is machined metallic tube used to house and protect sensors or heating elements. Thermowells not only protect heaters and sensors from erosive or corrosive media, they also allow for easy removal and replacement without exposing the process media. What is a cartridge heater? A cartridge heater is a cylindrically shaped electric heating element intended to be inserted in holes in metal platens or immersed in flowing media. The design incorporates a ceramic bobbin wound with nichrome resistance wire, carefully centered inside a metallic tube, and then backfilled with magnesium oxide (MgO), which provides electrical insulation. 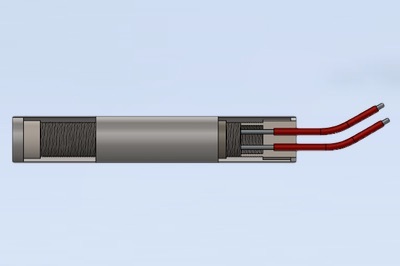 Cartridge heaters can be either swaged (compacted MgO) or un-swaged (loosely filled MgO). Swaging allows for maximum heat transfer to outside surfaces while keeping internal heater temperatures as low as possible, and preserving dielectric qualities. What is a sealed cartridge heater? A sealed cartridge heater incorporates all of the characteristics of a standard cartridge heater but is additionally sealed with BCE’s proprietary epoxy seal making it vacuum compatible. The seal additionally elongates heater life, especially in high humidity and moisture environments. What electrical tests are performed on heaters? Heaters undergo 3 main electrical tests: Resistance, MegOhm and Hipot. A resistance test is performed using a fluke meter to ensure that the heater is manufactured within the correct tolerances of the electrical specifications. Heater leads are connected directly to the fluke meter leads to perform the test. A MegOhm or Insulation Resistance test is performed using a megohmmeter. As its name implies it tests for any breakdown in a heater’s insulating material. The test is performed by supplying low to medium voltage to the insulating material for a small period of time. A Hipot test is also used to assess the dielectric strength of the heater’s insulating material. In addition to performing a Dielectric Withstand Test like the Megohm, it can also perform a Dielectric Breakdown Test. This means that the heater insulating material is shocked at very high voltages until failure is achieved. This is more commonly performed on samples as it destroys the heater. A thermocouple is a thermoelectric device that measures temperature. When the wire junction of its two dissimilar metals changes in temperature, a small voltage is created. The voltage is then used to calculate the temperature using the thermocouple’s reference table. RTD stands for "resistance temperature detector". It is generally constructed of a fine and pure metallic wire wound around a ceramic or glass core. The relationship between wire resistance and temperature is used to sense the temperature of other devices. The design and manufacture of custom heating elements and thermal systems are a specialty of BCE Inc. (Belilove Company-Engineers), a Hayward, California-based company that has served the aerospace, semiconductor, analytical and medical equipment industries for more than 25 years. As both a manufacturer and integrator of components, BCE offers custom electrical heaters, sensors, and controls as discrete components, or as part of a larger, value added thermal system. Visit https://bcemfg.com or call 510-274-199 for more information. What is a vacuum chamber? It is an enclosure in which a low pressure or vacuum environment is created through the removal of air and gases. 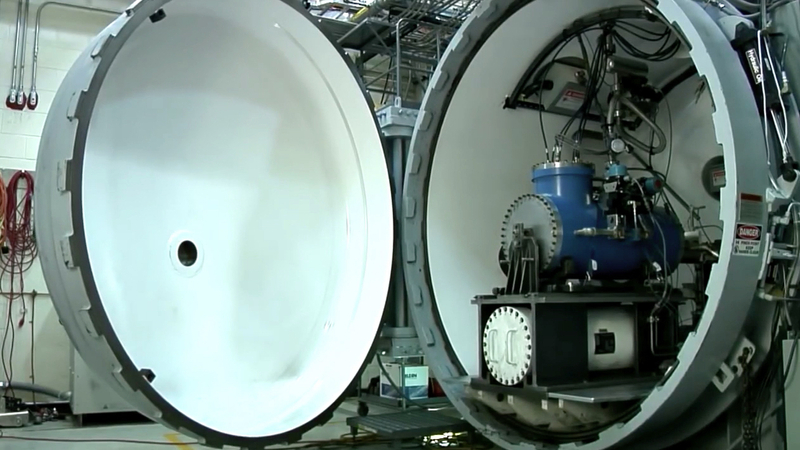 Feedthroughs are electro-mechanical devices that provide leak-proof electrical and pressure connections into a vacuum chamber. What is a hermetic seal on a feedthrough? It provides an airtight seal against contaminants entering a vacuum chamber. Contaminants can include gases and fluids like moisture, humidity, and chemicals. What processes are used to provide a hermetic seal? Hermetic seals are generally processed in furnaces under regulated temperatures and pressures. They can be glass-to metal, ceramic-to-metal or epoxy based. What metric is used to assess the hermeticity of a feedthrough? Feedthroughs generally undergo helium leak checks to establish the helium leak rate, an indicator of the feedthroughs’ vacuum compatibility. Prior to a helium leak check, feedthroughs are visually inspected for cracks, damage and porosity in the seal. What is the NASA ASTM E595 standard? This standard pertains to epoxies that exhibit low Total Mass Loss and Collected Volatile Condensable Materials during Outgassing in a vacuum environment. Ideally a rocket engine would capitalize on internal heat dissipations to create a self-regulating thermal environment. However, in the majority of instances, maintaining a high flow rate of cold propellants can obstruct the flow path. Thus, it becomes essential to integrate resistive heaters inside the flow path’s valves and manifolds. Surface-mounted patch heaters are generally used for this application. These are polyimide/silicone sheathed resistive elements with one side adhered directly to the valves and manifolds. 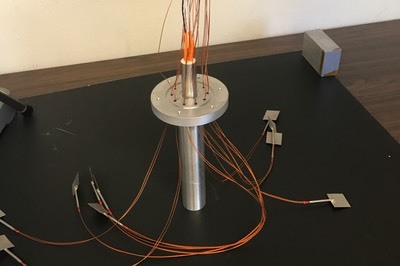 Although patch heaters may present a viable solution, the BCE HEM Sealed Heater™ outperforms as heat flows uniformly from inside the cartridge directly to the heated bodies. This is because they are secured directly to components by the means of an integrated flange. In essence, the BCE HEM Sealed Heater™ incorporates both the cartridge heaters’ wire wound resistive element encased in a metal sheath and the vacuum compatibility of a feedthrough. Furthermore, the BCE proprietary epoxy seal allows the heater to pass strict electrical tests ensuring the purity of the dielectric materials and hence, preventing shorting. The BCE HEM Sealed Heater™ proved to be the most optimal design for the heating of fast-flowing liquid propellants. The heater incorporated all engineering requirements and was mounted into the manifold through an integrated flange using custom hardware. In addition, the heater’s vacuum compatibility was ensured through BCE’s proprietary black epoxy meeting NASA ASTM E595. Furthermore, successful rocket launches into lower to high earth orbit validate that the BCE HEM Sealed Heater™ is rocket ready and capable of high vacuum applications. BCE, the ultimate partner for resistive vacuum applications. For more information on the HEM Sealed Heater visit this link.